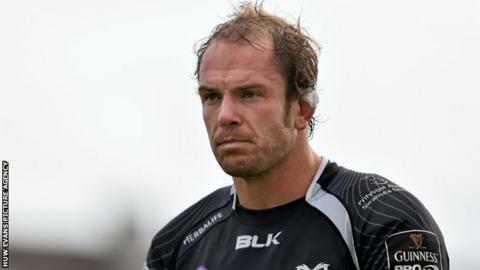 Wales lock Alun Wyn Jones says he is still undecided on his Ospreys future. The 30-year-old's current deal expires at the end of this season but Ospreys head coach Steve Tandy is hopeful he will recommit. Former Ospreys coach Sean Holley believes clubs in England and France will be interested in signing Jones. "There's certain things I've got to weigh up before I can make a final decision," Jones said. "Everything's joined up in fairness, credit to the Ospreys and the [Welsh Rugby] Union with regards to that. "Ultimately I've got to make the decision sooner or later." Jones, who has won 94 Wales caps and played six Tests for the British and Irish Lions, made his Ospreys debut in 2005. He signed a Welsh Rugby Union dual contract in March 2015, a deal which is 60% funded by the Welsh Rugby Union and 40% by the region. Jones said he had a number of factors to consider before deciding on his future. "I've got a family now and I've got to make a decision that's right for me," Jones added. "I'm not going to be one of those that comes out and says that the culture is the massive draw. "Ultimately I'm going to have a job wherever I go or whatever I do. Even if I stay, I'll still have a job. "And financially if I was solely motivated by that I would have gone on the previous two contract negotiations I've had at certain times and certain places."